we seek to dismantle white supremacy." African people throughout the world are uniformly under the yoke of white supremacy. This has created tremendous problems for us as a people. There are solutions to these problems that we must be reminded of time and time again. These solutions have come from the wisdom of the ancestors and their deep thought. Our thinkers and activists of the nineteenth and twentieth-centuries have set forth many of the solutions to the problems and crisis of African people. From time to time, movements have unfolded that have picked up on the ideas of these thinkers and activists. When this has occurred serious challenges to breaking the yoke of white supremacy seemed within reach. However, due to internal and external manipulations of these movements they became short lived. For example, one of the most successful of these movements was the Garvey Movement of the 1920s. As African people in the twenty-first-century, it is imperative that we collectively join and participate in the Reparations Movement as we seek to dismantle white supremacy. Let us briefly examine some of the ideas our leaders presented in the nineteenth and early twentieth-centuries that should be the foundation for establishing the framework for the growing Reparations Movement at this critical juncture in the history of African people. In this spirit, let us listen to the wisdom of our ancestors as we continue to forge ahead in strengthening our Black Liberation and Reparations Movements. Our challenge is to study our history, listen to the wisdom of our ancestors, and take appropriate action. Long live the Spirit and Wisdom of our Ancestors! 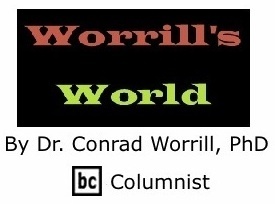 BlackCommentator.com Columnist, Conrad W. Worrill, PhD, is the National Chairman Emeritus of the National Black United Front (NBUF). Contact Dr. Worrill and BC.